Just regular folks. : Falling apart. Our front walk has been suffering for a few years now. 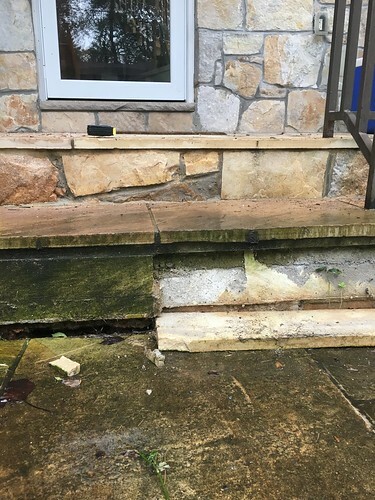 The stones separated as the ground settled and created this space between the bottom step and the front walkway. Then about a year ago, one of the stones fell off of its substrate. 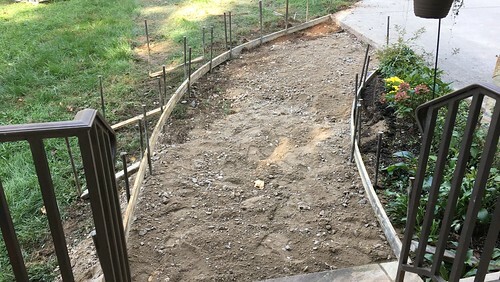 The front walkway slopes downward from the driveway, so that spot where the gap is always collected water and ice (also! green mildew? mold? it's in a shady spot) and it wasn't doing so well. Our front step looked like the above for a long time. For me, there are brave things and braver things. I have no problem moving the family to Taiwan or trying to go to school while working or going to a party/movies/restaurant by myself. But I have some courage problem with home repairs. I falter and I hesitate. 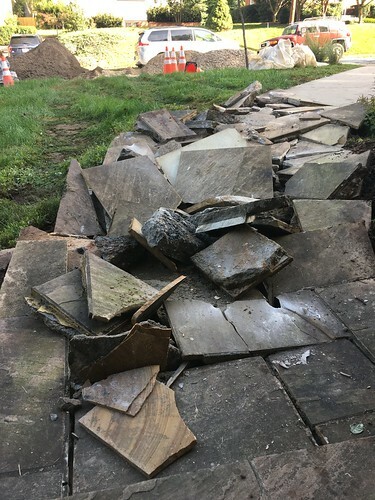 It has something to do with not wanting to spend the money, worried I won't find a reputable contractor and also maybe also thinking I'll regret the final outcome. So it takes me a lot of effort to manage home repairs that require other people. But finally someone made a decision for us. 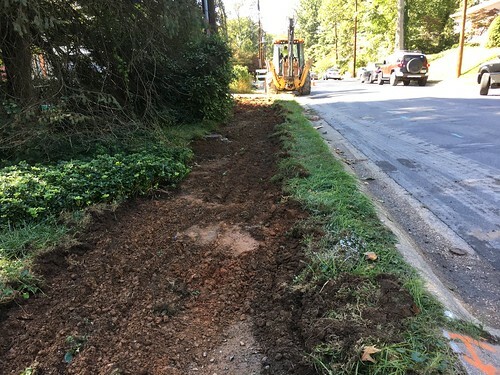 They are ripping out all the sidewalks, curbs and driveway pitches on our street to make them ADA compliant (and I will tell you that this is fantastic, not only for folks like Edda (which there are few), but also for moms with baby strollers (you were a baby once and you liked being walked) and older folks with walkers (with luck, you will be one of these too). 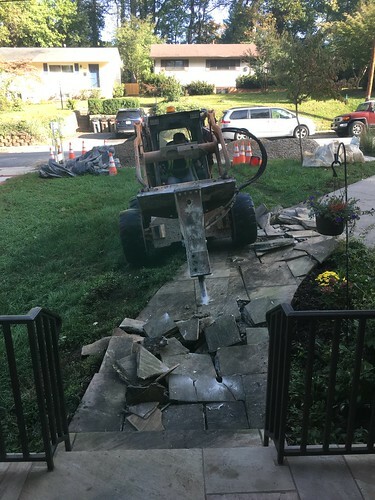 We asked the contractor to do our front walkway for us. No pavers, no fancy stone, no patterns. 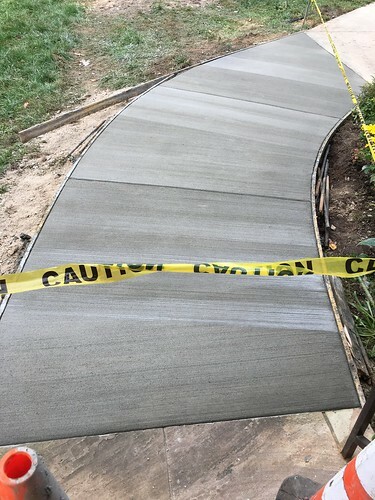 Just plain concrete. They jackhammered the very nice and expensive & poorly installed stonework. They scooted the rubble away. They put in the forms. Poured the new concrete. We made it higher and flatter and flush against the first step, so we lost a step which is good because fewer steps = slightly more accessible. OMG. You do things like plumbing which I would never, ever even consider doing! Getting the street contractor (who knows cement) to do what you did is so great. Sometimes waiting brings about the best decisions!